Despite working online and spending way too much time on a computer and on the Internet, I still do enjoy reading offline publications. 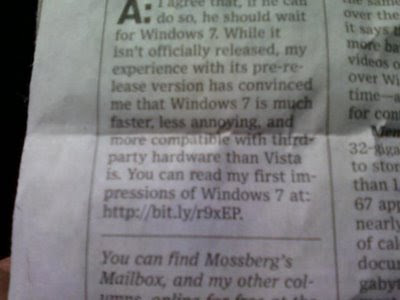 As I've mentioned in the past, I'm an avid WSJ print edition reader. And Thursdays is my favorite because it's the tech edition, featuring Walt Mossberg. Today, as I was reading his Mossberg Mailbox, something caught my eye. As long as I'm talking about print publications, I was also skimming my latest issue of OMMA today and laughed when I saw this ridiculous job title! 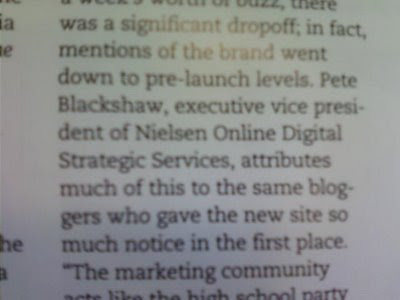 If you work for Nielsen Online, the digital arm of Nielsen, why do you need Digital in your department name? Isn't that implied if you're in the online division? No disrespect to Pete Blackshaw here. But come on? Nielsen Online Digital Strategic Services? No one, not even someone in the copywriter group, read that and thought it was redundant??? I know Intel was getting trashed today by "arm chair branding geeks" for its announced product line name changes. And they have a very complex problem, given what they sell, and as a former brand strategist, I don't think there is one "correct" answer. But this Nielsen thing seems like a no-brainer.